These are the most corrupt countries in the world. 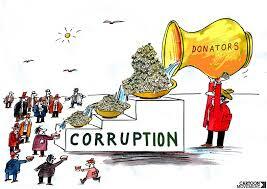 Despite global efforts against corruption , the planet is still slowly moving in the war against this practice. According to the 2017 edition of the Corruption Perceptions Index released on Wednesday, public sectors in 180 countries were perceived as corrupt at some level by experts and business people from all over the world. A frightening trend brought to bear by the report is that countries that exhibit the lowest levels of media protection and civil engagement entities, such as NGOs, are those with the highest levels of corruption. One in five journalists killed since 2012 have had their homicides linked to their investigative activities against the public sector. The survey is produced every year by Transparency International and aims to build a panorama of the fight against corruption. The result is a global ranking that ranks countries among the most and least corrupt. The score ranges from zero to 100, where zero is the reference for "highly corrupted" and 100 for "very righteous". This year, 180 countries were investigated. The bad news is that none of them reached the ideal score and the average score obtained this year follows the line of what was observed the previous year , and that is 43. According to the entity, this is a serious indicator of the how endemic is the situation around the globe, from Western Europe, whose average score is 66, to sub-Saharan Africa, 32. Among those who may be considered the most corrupt countries, few changes compared to 2016. Somalia remains the country with the worst score, 8, and is followed by South Sudan, 12 points, and Syria, 14 points. In common, these places experience intense political turmoil, threats of terrorism, civil war and poverty-stricken populations. Venezuela is the worst performing country in the Americas. When you look at the top of the ranking, where the countries with the most positive scores are positioned, the dominance of developed countries is evident and there are no significant changes. The New Zealand jumps one step, assuming the first position, while one Da falls, passing to the second. About Brazil, the scenario is worrisome . The country has 17 positions compared to last year: it went from 79th place to 96th, behind Rwanda and Saudi Arabia, but tied with Zambia and Indonesia. It is the worst situation ever faced in the scope of the study. Among Latinos, laurels for Uruguay, which is in the 23rd, surpassing Portugal, Spain and South Korea. The map below, compiled by the EXAME website based on the Transparency International survey, shows how more and less corrupt countries are distributed. Brazil, Uruguay and the United States are not part of these groups, but were included for comparison purposes.